Download from here:- Watch this space. Reference Warrior is a reference image viewer and organizer, which will make your day to day creative process easier and more efficient. Lock the image viewer and make it transparent so you can trace with any other 3D or 2D creative software (like digital tracing paper). Opens the following image files - gif(+ani), png(+ani), jpg, jpeg, bmp, tif, tiff, tga, psd, pcx, dds, hdr, ico, emf, wmf and more. Manipulate the reference images by rotating, panning, scaling, setting transparency, adding text, monochrome, invert and copying etc. Create image collections (.rwc) which will group reference images together and remember their scale and position etc. You can use the Screen Capture tool (Selection Capture) to create art boards and working references. Hide tool allows you to toggle your reference images visibility. Keep on top allows you to make your reference images the priority over other windows open in your workspace and you can lock them to your workspace. Tiny and task tray modes means you won’t have your workspace cluttered. You can access all the tools from the RW task tray icon. 1: Open one image at a time. 2: Show/Hide the image viewers. 3: Make RW stay on top of the window stack. 4: Lock the image viewers in place to work on the application beneath. 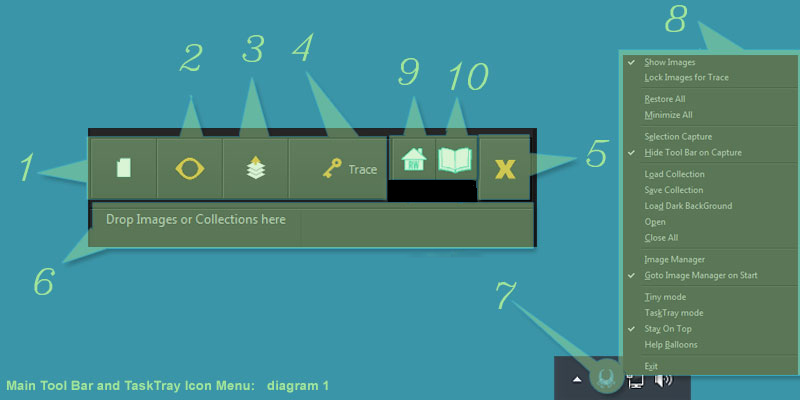 6: Main Toolbar drag & drop area for image(s)/Collections. 8: Main Toolbar/Task Tray Icon Popup menu. 9: Open the About dialog. 10: Open the Quick Help dialog. 12: Transparency widget and (Rotation widget when holding the R key). 13: Rotation widget when holding the R key. 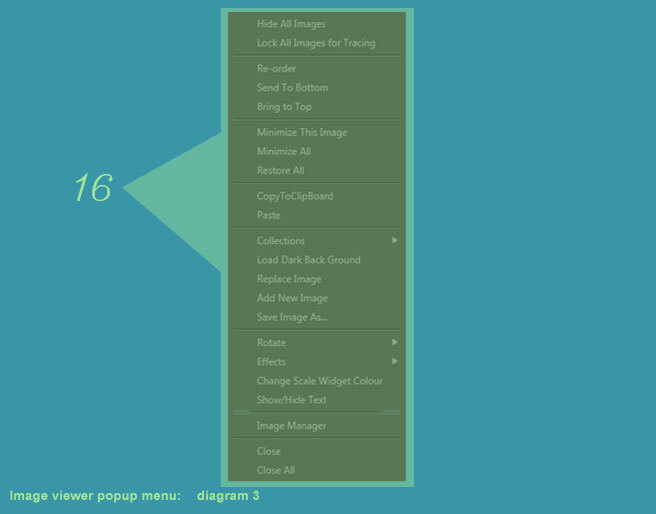 16: Image viewer Popup Menu. Sliding the transparency widget will increase the transparency of your image(s) or hold T and Left mouse. Holding R will change the transparency widget to the rotation widget. Press H to toggle the visibility of the image viewer's interface widgets . To pan image(s) drag with the Left mouse. To zoom image(s) in and out scroll with the Middle mouse or hold Z and Left mouse. To move the image viewer window(s) drag with the Middle mouse or hold Control and Left mouse. Right mouse click for the pop up menu.. Double click on the image viewer to load an image. 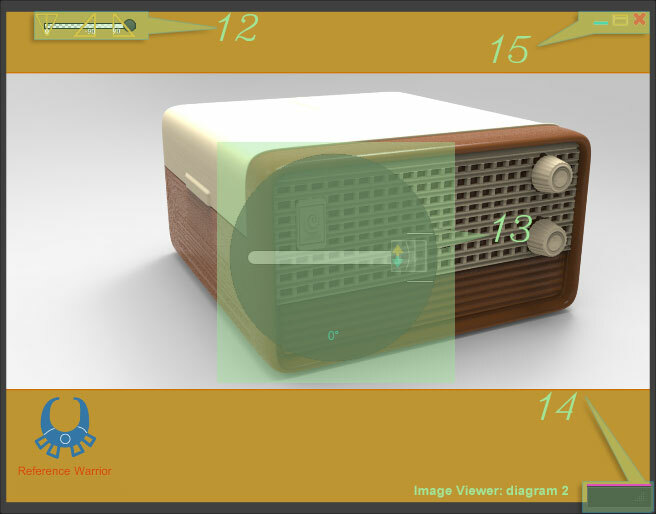 Double click on the image viewer's scale widget to minimize viewer. To move the main toolbar drag with the Left mouse. Drag and drop images or collection files(.rwc) onto the main toolbar to open new image(s). Reference Manager update 10 is now available. Remember there aren’t any download links from Wilierco.com or Gumroad. Use the temporary links provided, and if your link expires ask for new link. A warm thanks to everyone who helped in 2018. This build will be valid until the 1st of Nov 2018. With Reference Manager Update 7. This build will be valid until the 1st of Sept 2018. With Reference Manager Update 5. It is with great regret there will be no open beta testing. This build will be valid until the 1st of Aug 2018. With Reference Manager Update 4. This is a free to use version with a single-seat license. This version is unsupported and will not be developed further. tga, psd, pcx, dds, hdr file types are not supported. This was only made possible by donations. This build will be valid until the 1st of July 2018. First look at Reference Manager. This build will be valid until the 1st of June 2018. You can now open more file types- Photoshop files and Targa files to name a few (tga, psd, pcx, dds, hdr and more.). Fixed image name Unicode Bug in Collections. it is with great regret there will be no lifting of the beta restriction. New build has been released. This build will be valid until the 1st of May 2018. Added support for playing Animated Gif. Shortcuts Keys(F11 play mode F12 pause). This build will be valid until the 1st of April 2018. More Shortcuts Keys have been added. This build will be valid until the 1st of March 2018. Shortcuts Keys have been added. This build will be valid until the 1st of February 2018. Image Collections now remember text and scale widget colours. This build will be valid until the 1st of December 2017. "Opening Images", "Basic image viewer navigation", "Lock tracing and pinning" and "User interface modes". New build has been released, we've worked on the internal structure so it's ready to use with the Image Manager Application. This build will be valid until the 1st of November 2017.